This is the final for Prog 219 taken June 2015. Many details are perhaps not filled in yet, but this should be enough to get you started. The core goal is to create a web application that runs on AWS with upstart and links to a MongoDb database running on MongoLab. Upstart ensuring your app stays up and running on AWS. 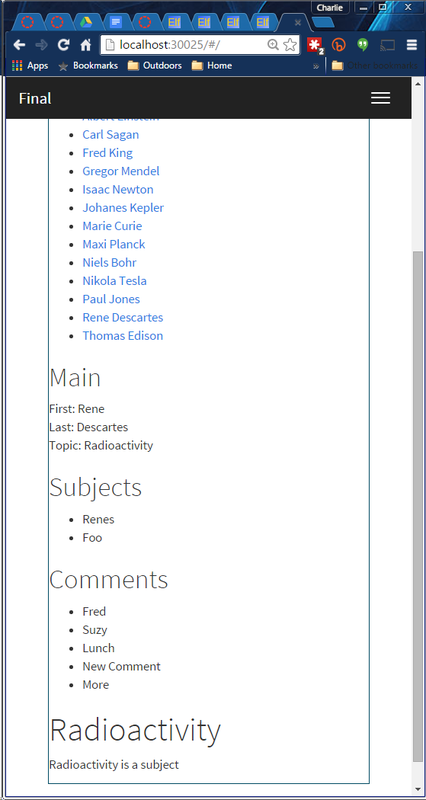 When the user navigates to the main page they should be able to click on a topic and see a document associated with it. All I want to see at this point is a login page. But ideally, in some later course, we would learn how to allow the user to see the home page, the about page and the login page, but to use the pages that provide the ability to edit data, one would have to be signed in. We are most of the way to getting that done, but we are just out of time. The ability to edit the main fields of your document. There should be at least three main fields. These will be for extra credit only. Put the program itsefl in your repository in Week11-Final. Provide a valid link to the place on AWS where you program is running with upstart. By default it will be: :30027. Just to be clear: it is important that you include specific information on how to find your program running on AWS. A valid link with the correct text in the anchor tag would be good. There are several ways to get extra credit. You can already view a document related to a topic. I want to you to be able to view documents related to each of the subjects associated with a topic. 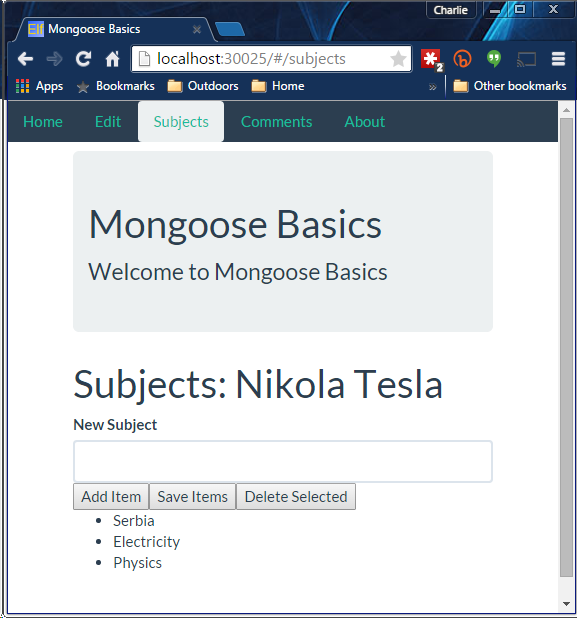 The point is that the user should be able to see an overview document on the home page and then drill into a series of subtopics on the Subjects page. Navigate to the home page and view a document, defined as a Jade file, that is associated with a selected topic. Add in the unit tests from the midterm. No need to have the "live" tests on the main page, but the one's from the test folder. One of your duties as a developer is to make sure that your code can be compiled and run by other developers. Don't leave mistakes in your code, or in package.json, or bower.json, that cause build errors. You should test the code that you check in, and make sure it builds. Create a final.conf in your final folder. Open port 30027 and set the source to Anywhere. Then go to the appropriate URL and test your work. For problems, check /var/log/final.conf. Press F5 a few times to make sure you have the most recent copy if you are going back to that page after viewing it recently. This video shows one way to handle the login functionality in your application. This is not the only possible solution. You can do it differently, but if you are not sure what is wanted, this gives you an idea of what to shoot for.